Rotary- another prestigious Swiss watch brand established by Moise Dreyfuss in 1895. In 1940 Rotary became the official watch supplier for the British army just near around the World War II. During the war British Army drafting huge number of peoples, eventually Rotary watch reached almost every household during that period. Rotary watches’ head office is now in UK and now it is officially British company. It was elected as one of the UK’s “super brands” in 2006 and retained the place for successive years. Rotary watches is still independent family owned company. Rotary offers a wide range of watches, from high-end Swiss manufactured watches to less expensive imported watches without compromising in the quality. Let’s the overview of Rotary watches’ collections. Swiss made luxury! Yes, Rotary Les Originals is collection of high-end Swiss made watches. 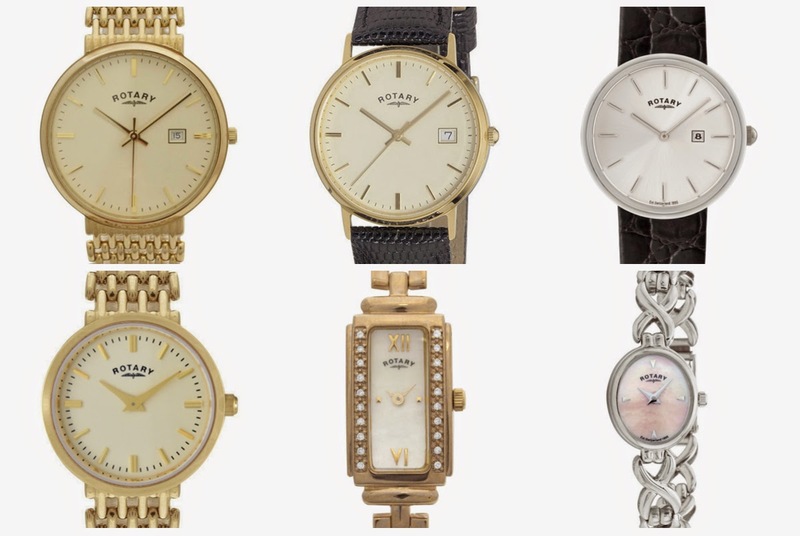 Classic round shape cases with variety of designs, these watches are perfect to complement your status. It includes variety of options like bracelets or leather straps, chronograph, variety of colour tones and colour combinations. Overall a complete collection to choose a perfect timepiece for regular day wear. See gents’ watches in first image and ladies in second. Jura is the latest arrival watches and actually it is part of Les Original collection but it includes some special features. Each timepiece features 21 jewels within the movement and also a striking full or part skeleton dial. The watches operates on Rotary’s first proprietary movement Calibre R.1003.21. Rotary offers lifetime guarantee. See only four limited pieces of the collection below. Rotary Ultra Slim watches, less than 5mm thickness. The stunning collection of dress watches underlines the Rotary’s dedication to its reputation. Classic round and square cases with only two hands and displays 1895, the foundation year. Various colour tones and combinations, available in both bracelets and leather straps. Rotary Ultra Slim watches are made to complete your sophisticated look. Rotary Aquaspeed collection includes contemporary sports watches, perfect for those looking for robust yet stylish timepieces. Some of them features chronograph as well as slide rules. I can tell you, Rotary offers stunning designs, greatest quality and lifetime guarantee in unbelievable price tag. Here are few timepieces, but you should look the complete collection to see stunning designs. As the name suggest, this collection includes watches made from precious metals like silver, 9ct and 18ct gold. These watches are made to keep your status high. See pictures below, upper three are gents watches and lower three are ladies watches. Two faces, two times and one watch. Rotary Revelation models features innovative design, two watch faces that can be set with two different time zones. These exceptional timepieces are made for busy traveller. See the demonstration graphics below. Also see some of the timepieces below. Apart from these, Rotary is global official timekeeper of popular Chelsea FC. So Rotary has designed special edition watches featuring Blue lion crest and Royal Blue detailing. If you are a Chelsea FC fan show your allegiance. See the watches below. That’s it for Rotary watches. Overall a good collection which includes watches for everyone. The quality of watches are impeccable. Most of the watches now comes with lifetime guarantee which is special treatments of Rotary watches customer.